GLEAGLE, the new brand of Geely, released officially on November 6, 2008. The trademark of Geely GLEAGLE is oval. It is a dynamic and stable picture, which symbols the dynamic and stable development of Geely GLEAGLE in the global market. Geely wheel rim is oval with the horn trend. This GLEAGLE wheel rim is made of steel. The front-wheel drive is adopted. Wuxi Hengsheng Wheel Co., Ltd is a professional Geely wheel rim manufacturer and supplier in China. 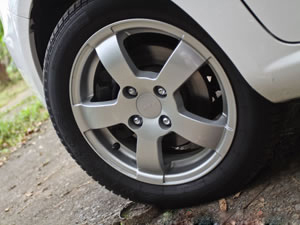 In addition to Geely wheel rim, we also provide other famous models steel wheels (rims) for our clients around the world, like SAAB wheel, Saturn wheel, Scion wheels, Subaru wheel, Suzuki wheel, Toyota wheel, Mini wheels (Mini rims), Volvo wheel, etc. We possess a professional technology team to guarantee the manufacturing of Geely wheel rim. We will checkout all the products and give out a survey report. According to the needs of every client, there will be a dynamic balance sample survey among parts of the qualified Geely wheel rim.